Another month down. Another month of reasonable, yet somewhat lackluster mileage. This is my lowest September on record in prep for marathon training…though I did take a week off to rest a tweaky calf and overcome a fever-inducing sinus infection. So, had I not been sick I would have been up at 90, which seems a bit more in line so maybe I’ll just stop second guessing everything. I needed the week off, it was a “low mileage” week since I had hit an 18-mile long run the week before and then a 20-miler the week after, and I feel good about the decision to take it off — this is the less is more plan, right? Right. Let’s just go with it. I hit two big runs recently. I did 18 miles on my birthday (which was on the 18th, and the numerical alliteration plus the doughnut and double Starbucks post-run reward were the best things about it). But my longest run to date was the 20 I did as September fell upon us. It was actually way worse than the birthday 18 — the humidity and the lingering sinus issues (coupled with the time off) meant a lot of taking it easy. I am chalking it up to “time on my feet” and not a real training run. At this stage I am confident that I can finish the marathon. I ran an 18 and a finished 20. Six more miles won’t be that big of a stretch on race day, but I am still unsure of how well I’ll finish the marathon. I have another big long run coming up; 20-22 next weekend, so hopefully we’ll get a slight reprieve on the weather, my upcoming work schedule/travel won’t kill me and I’ll have a stellar, confidence-boosting outing. Small steps. I see the marathon, but I am looking just ahead to that next 20. There is just 1 month, 2 days, 10 hours and 7 minutes out from Chicago! OH MY GOSH!!!! Nike sent me this email about how you can customize the Nike Air Pegasus and we all know how that’s my shoe and all and now I am thinking about dropping $120 so I can get a fly, custom pair of shoes for the race. What do you think of these babies? Ah what a beast! I can barely muster up 4 miles with the humidity! You are going to do awesome with the marathon! Ooh, thanks. Seriously, a little comment like that is such a boost! Makes me wan t to go run 15 right now 🙂 But, omg, I cannot wait til fall! Ugh. So sick of humidity. Them shoes is cool. Get ’em and run to Sweden so we can hang out! Oh i wish!!! Cant wait til you are home! But which shoes??? The green or the blue??? Practicality speaking, I’d say the blue. Non-practical and ‘in yo face’ side of me says GREEN!!! 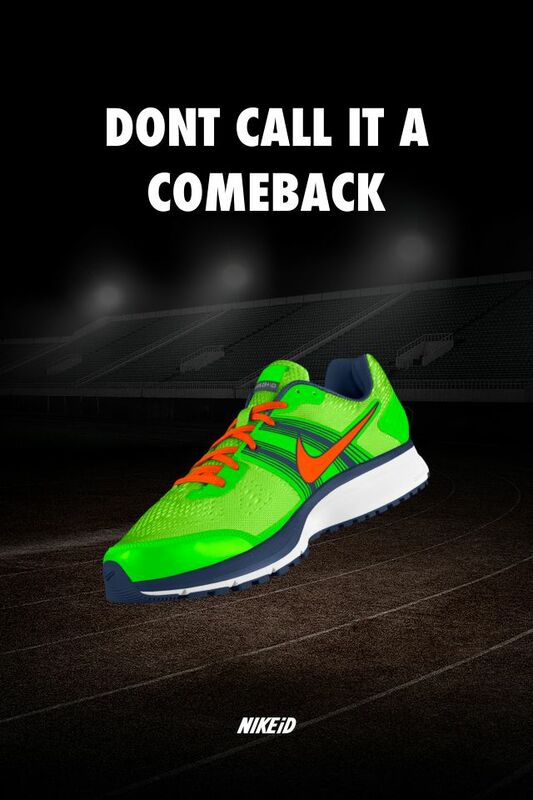 I saw that about the new Nike Pegasus customizing option in a magazine and totally of you. You can dooooo it! 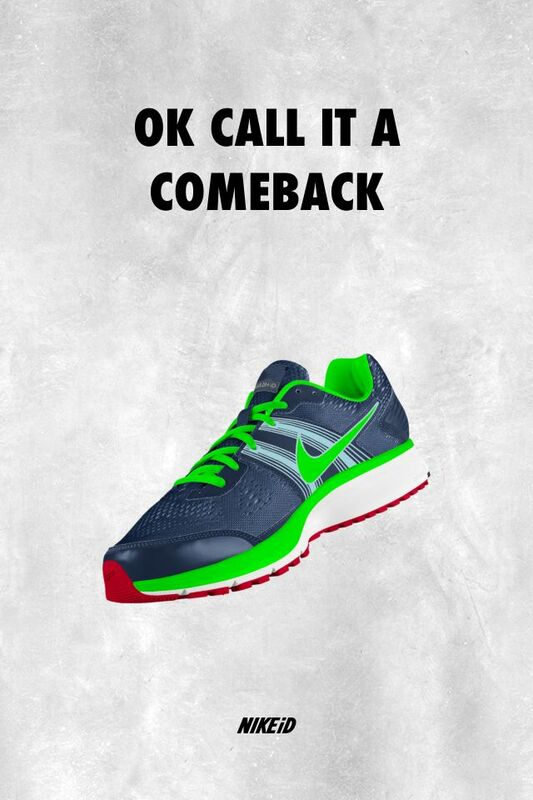 These are come back marathon shoes, they don’t need to be practical, right?? The green ones are obnoxious, but in a fun way I hope! !